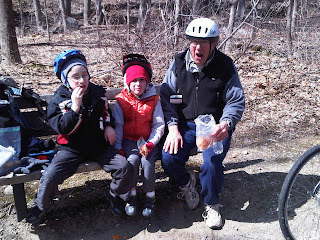 The boys and I met my father in Amawalk, NY to ride the North County Trail Way. Instead of riding north towards Baldwin Place like we did last time, I suggested that we ride south and little did I realize what treats were in store for us. It was pretty much down hill the entire 5 miles that we rode with the wind at our backs, which meant coming back was going to be fun. There were quite a few people out enjoying the nice weather and riding this trail. We got a nod from another Tandem pair and we saw a few others on trail-a-bikes but it seems nary a soul has ever seen a tandem trail-a-bike. The boys still have to work on their teamwork. There is still a lot of infighting on when to pedal and when not to. Initially they were pretty good but later Brodie got cocky and found it was a great way to annoy is older brother. Here is another attempt with mounting my helmet cam looking down backwards but my Camelbak gets in the way. Still, what's cool is that we are riding over the original railroad bridge that held trains a century ago. I still want to ride the entire trail some time. It's something like 60+ miles round trip. It's probably a 5 hour trip altogether. I am going to try and set up a work outing in which we do a round trip on it. Other than the pedal issues, the boys did really well. There was only need for two pee brakes, one for each. It's usually Brodie that needs to stop every 5 minutes to go but he only did it once and Elliot watered a few trees himself. And of course there is always the required snack. Cheese-its, Scooby snacks and an orange. The funny thing was that I told them we could only stop at a bench and they were bugging me to stop immediately following riding over the old Railroad bridge but I told them we could only stop at an empty bench. Thus 3 miles later we finally found one. 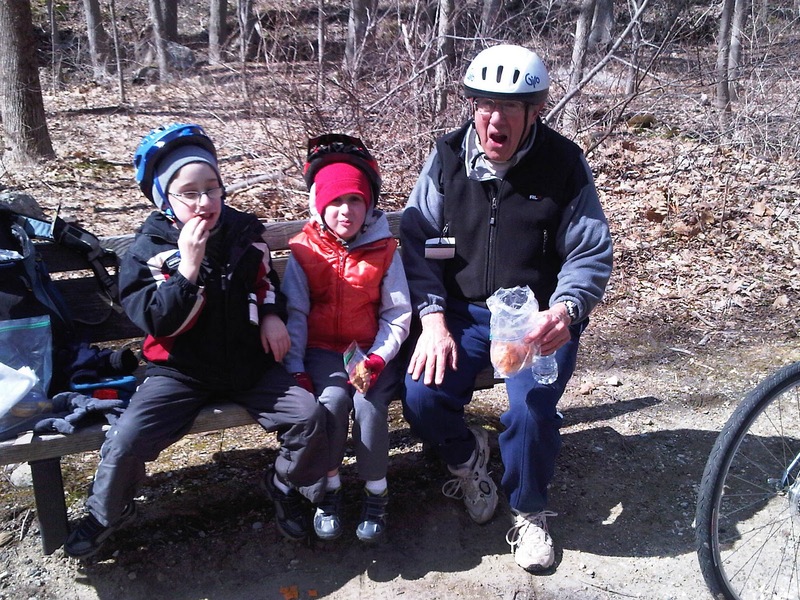 After the snack brake we rode up to Yorktown Heights where my father went ahead and we hung out at the train station play area. The boys love playing at this park and the last time we were here, after riding with my father, they played till dusk. That is one of the key ingredients to riding with my boys. They will always ride if they know there will be a stop at park. That's what makes the Monroe Trail so popular with them because Wolfe Park is right there. Middlebury is the same way. In Cheshire, we stop at Brooksvale Park but they have a small jungle gym and they loose interest on it quickly. 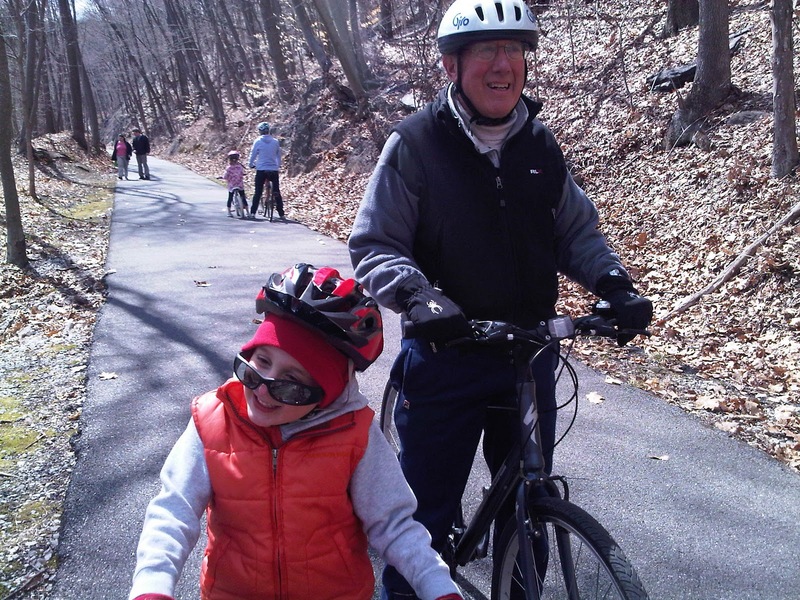 Next weekend we are going to try the Farmington Heritage Canal Trail. Starting in Farmington, we'll ride up to Simsbury and have lunch at this big park that has a bunch of jungle gyms and then turn around and ride back. A nice 26 mile ride pulling upwards of 150 lbs of kids and trail-a-bike should be good conditioning for the Fattire Classic the following weekend.